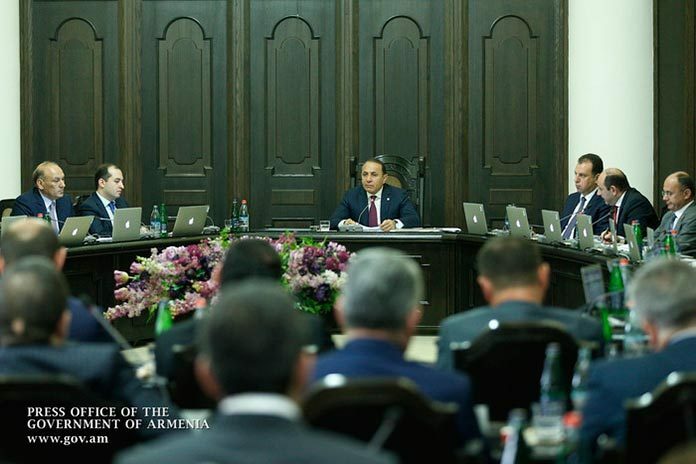 Armenian Prime Minister Hovik Abrahamyan has urged his Cabinet members to engage with the opposition and other “capable” forces to find solutions to expedite reforms in various sectors of political and public life in the country. “Are we developing, are we fighting corruption, do we have a combat-ready army? The answer is yes. But is all this sufficient for us to withstand new challenges? I think I will express everyone’s opinion if I say no,” the premier said. Abrahamyan reminded about his initiative on starting a series of discussions with the involvement of lawmakers, including opposition members of the National Assembly, as well as other “capable forces of society”. “And the matter concerns not only discussions. Solutions, decisions that we will arrive at should be realized as soon as possible. And issues that are going to become subject to discussion are numerous. Among them are those that concern economic development, fight against vicious phenomena in the health and education sectors, and numerous other issues,” said Abrahamyan, drawing his Cabinet’s attention also to “noteworthy researches” on ways of Armenia’s development in the Diaspora. Abrahamyan said the first such weekly discussion is scheduled to take place as early as on May 14.